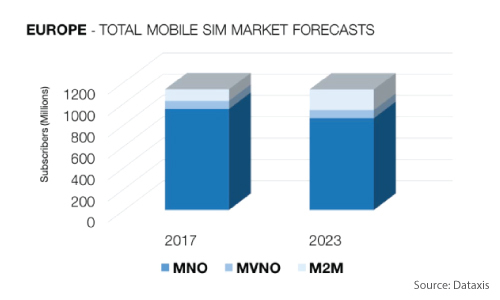 According to Dataxis latest research, the total Mobile SIM market in Europe is becoming saturated, the subscriber growth is mostly due to rapid adoption of 4G and M2M. At the end of 2017, there were 340 million 4G subscribers in Europe, accounting for 33% of the total mobile subscribers (excluding M2M). 4G connections overtook 3G in 2017 and is expected to reach 64% of the total by 2023 in Europe. M2M will grow at a compound annual growth (CAGR) of 9% during the forecast period of 2017-23, accounting for 17% of the total, reaching 193 million connections, in 2023. Dataxis strongly believes that European industry players and various regulatory authorities are seeking to take a significant role in 5G adoption across the region. 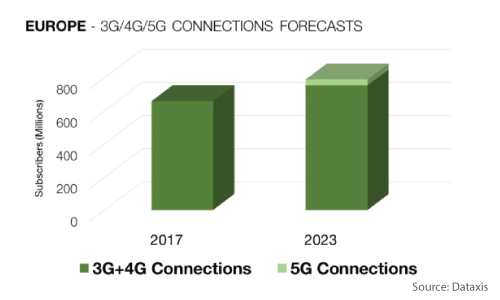 Looking at the investments in 5G rollouts and trials, Europe will reach 36 million 5G connections in 2023, taking into account commercial launch after 2020.